This is an attachment point for palm rest, or at least it will be. Notice the slot at the bottom of the case? That will be another palm rest attachment point. But that will have to come much later. 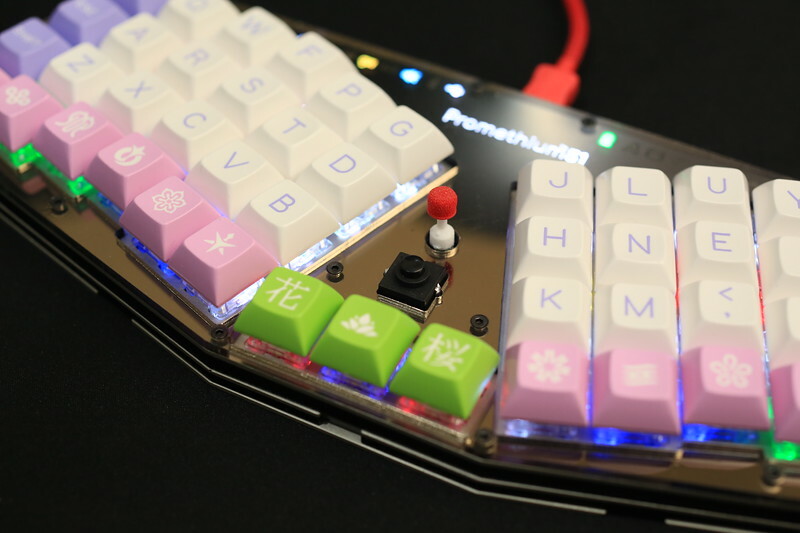 I'm using Suka's 3D printed Trackpoint extension. They are designed for older version of Trackpoint, and I prefer a newer version with metal plate, so I glued them together using cyanoacrylate glue. 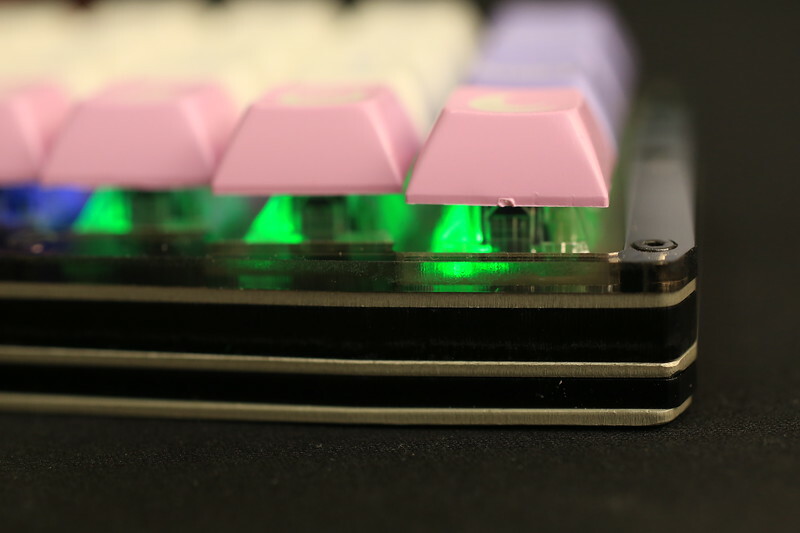 The top of the extension, though, is a perfect fit for Trackpoint cap. Suka's extension comes with several different length of extension. 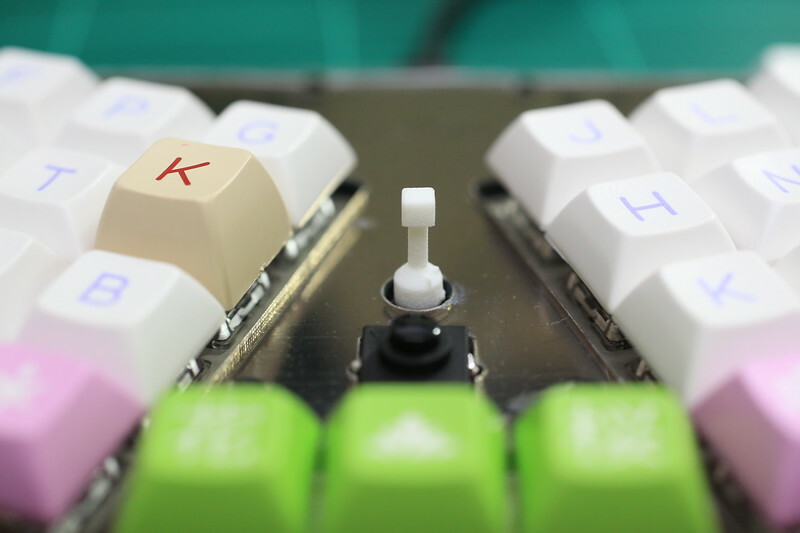 Here I have the tallest keycap (SA), and the shortest (DSA) to see which Trackpoint height I prefer for both. Because the Trackpoint extension is glued, I don't have the option to change them afterwards. 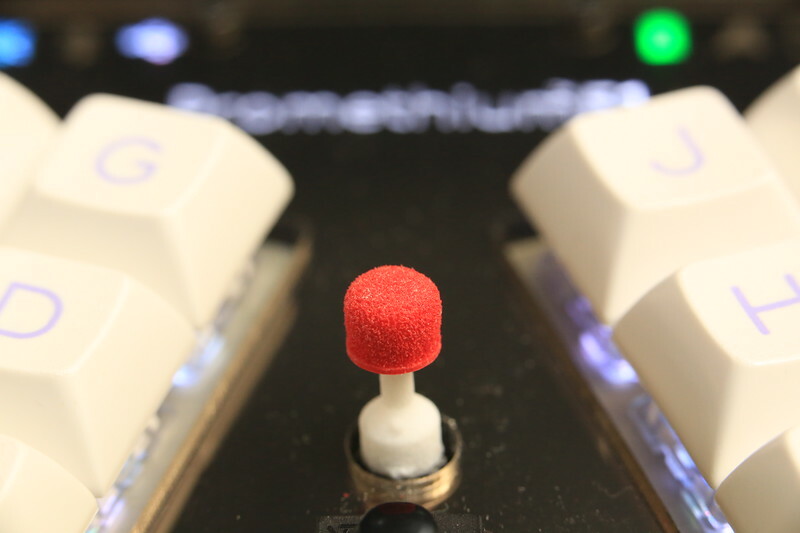 Trackpoint with cat's tongue cap. Indicator LEDs. 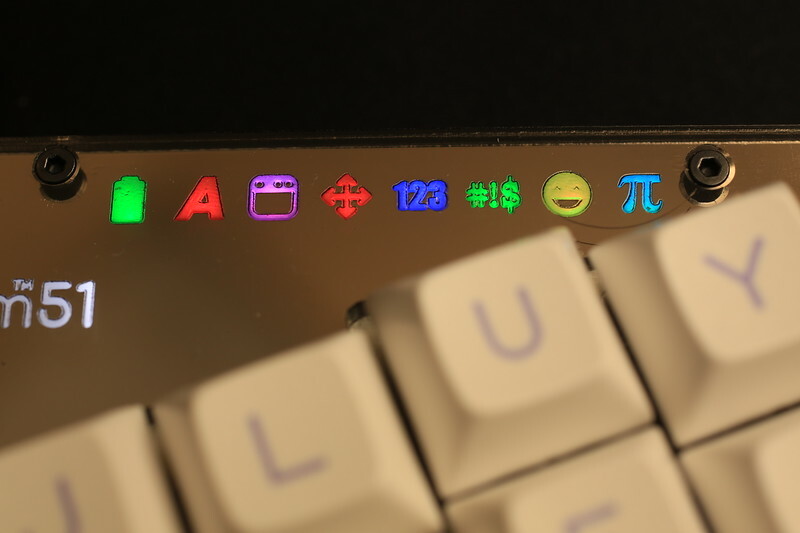 From left to right: battery level, capslock, GUI layer, function layer, number layer, punctuation layer, emoji layer, greek layer. And the other side. 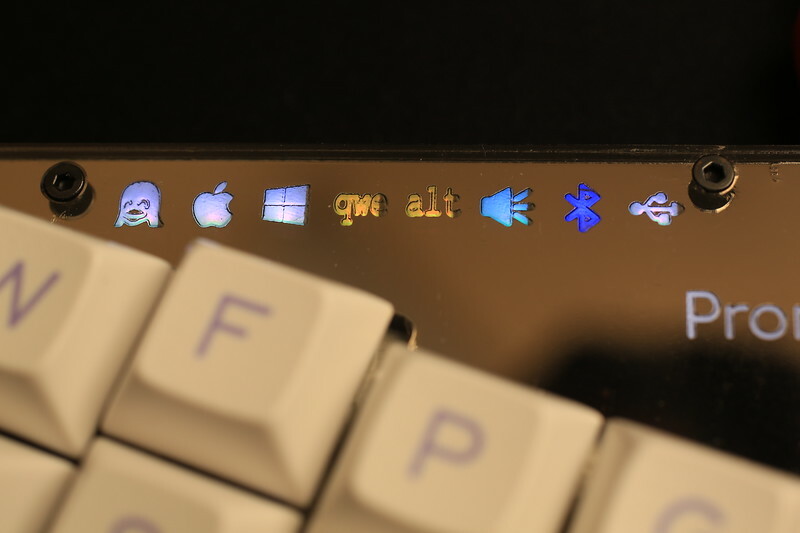 From left to right: Linux/Apple/Windows Unicode input method, QWERTY or alternative layout, faux clicky, Bluetooth, USB. Legends are a little off here, probably caused by some problems with laser cutting. All indicator lights are on. MicroUSB port from the controller. It is flush with the case, so any cable is compatible. The upper plate should not have the notch, but that will do for now. I can squeeze about 1mm of height if I use thinner aluminum for middle and bottom plates. But getting plates in two different thickness for small scale projects is not economical, at least from my perspective. 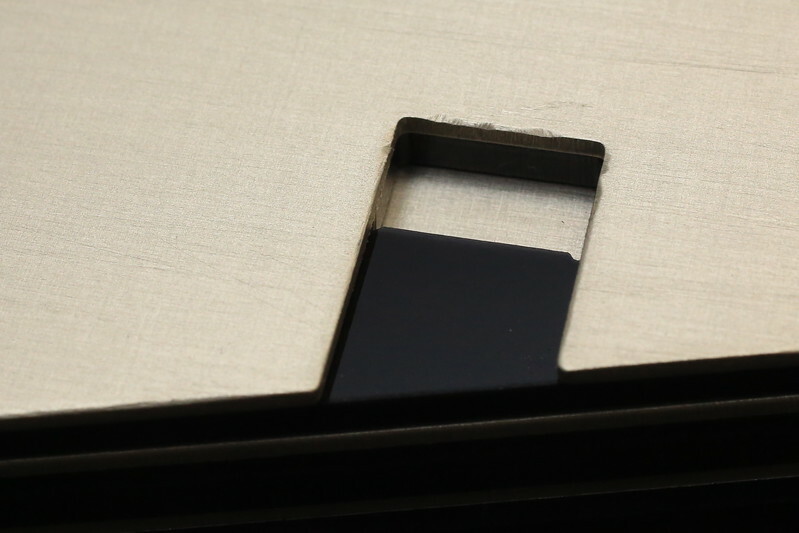 Using thinner plates could mean some countersinking will need to extend to the acrylic parts. It is probably possible to squeeze 0.5mm from the upper chamber if I can find acrylic sheets in 4.5mm thickness. If going that route, then it will be necessary to replace the 5mm M2 hex spacers with 4mm ones. If a thinner battery is available, then it should be possible to reduce bottom chamber to match the thickness of the battery. 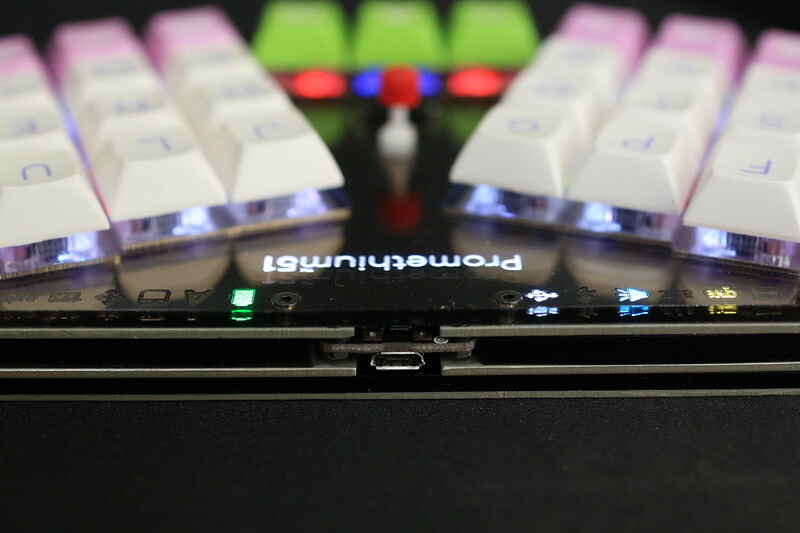 If thinness is paramount, then it is possible to forego battery and piezo buzzer; remove bottom chamber and make the middle plate the bottom plate. I can get 8mm bottom to switch plate thickness. And this is still not including the optimizations above. 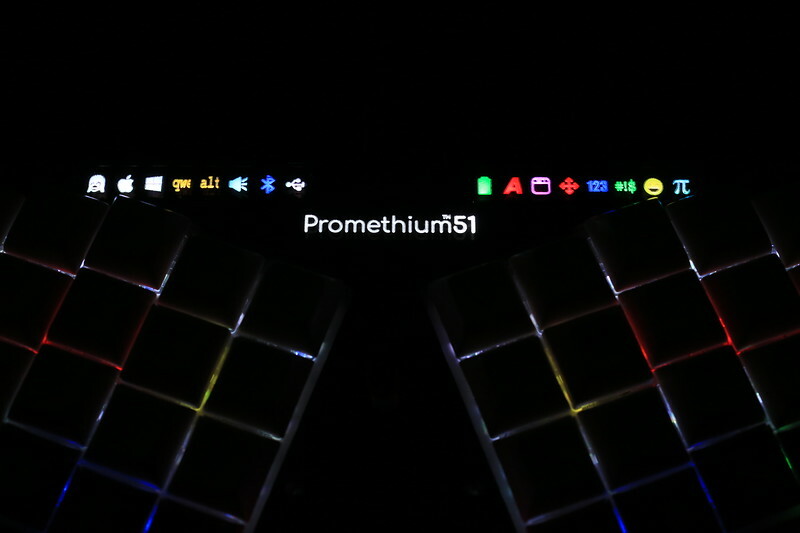 It may be necessary to remove the protruding JST-PH battery connector from the Adafruit controller, but if rubber feet are being used and they are in adequate height, then it might not be required. The faceplate is 3mm in height, but it doesn't add to overall height (it sits on the switch plate). 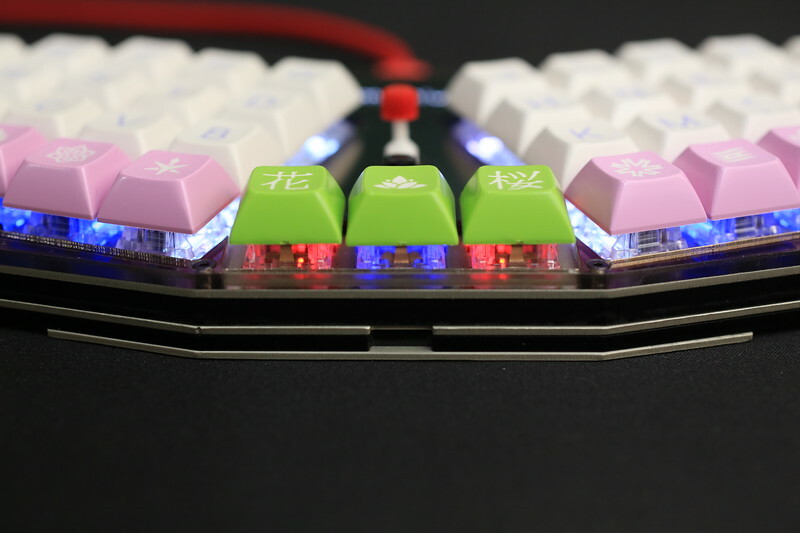 So, it is not critical to optimize thickness here, but thinner acrylic mirrors are available, though choices of colors are far more limited. 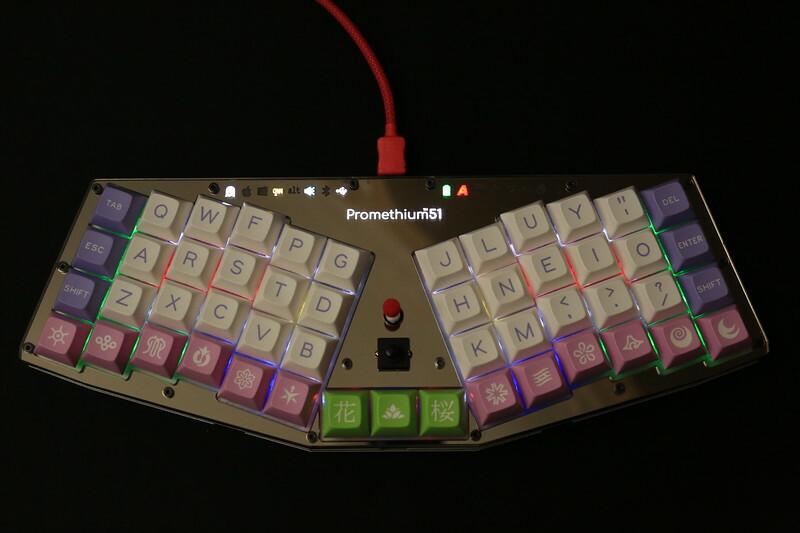 Keyset requirement is exactly the same as Planck, plus 3 1U keycaps for Trackpoint buttons. 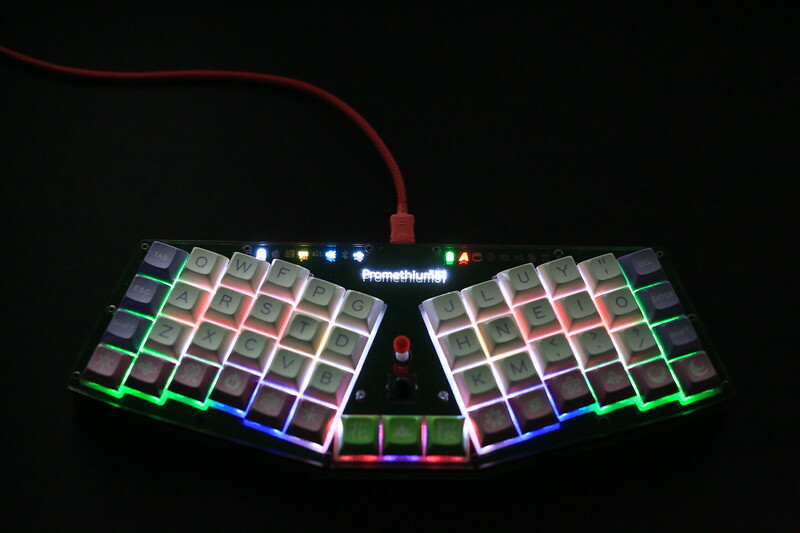 There's an RGB LED under each switch, inclucing Trackpoint buttons. Switch LEDs and indicator LEDs are connected in a single WS2812/SK6812 bus. Appearance can be easily customized by changing faceplate. 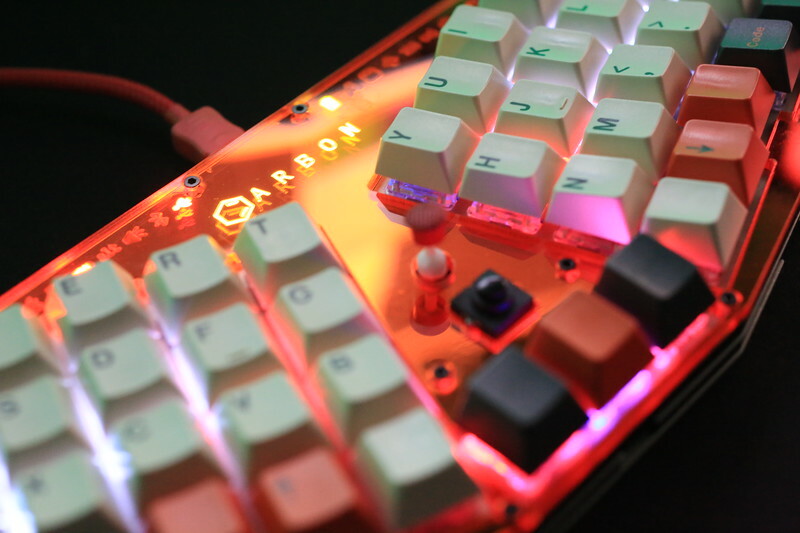 This one is dressed with GMK Carbon keyset together with a matching faceplate. 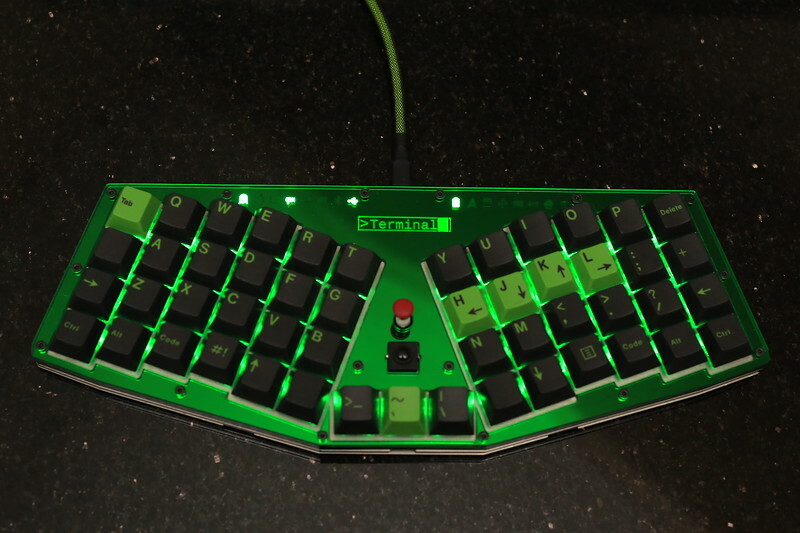 And this is GMK Terminal with a matching faceplate.